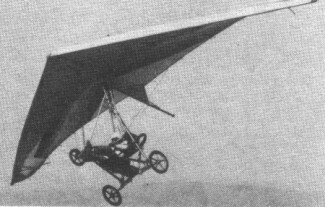 Single-seat single-engined flexwing aircraft with weight-shift control. Rogallo wing with keel pocket. Pilot suspended below wing in trike unit, using bar to control pitch and yaw/roll by altering relative positions of trike unit and wing. Wing braced from above by kingpost and cables, from below by cables; rigid cross-tube construction; 60% double-surface enclosing cross-tube; pre-formed ribs. Undercarriage has three wheels in tricycle formation; steel-spring suspension on nosewheel and bungee suspension on main wheels. Push-right go-left nosewheel steering independent from yaw control. Brakes on main wheels. Aluminium-tube trike unit, without pod. Engine mounted below wing driving pusher propeller. Wing has foam insert in leading edges. The Jetwing ATV (All Terrain Vehicle) is an original concept: it is not purely a trike in the conventional sense, because its wheels can be replaced by floats. By removing the wing and fitting the rear of the floats with a triangular tubular structure supporting a large rudder, the Jetwing can be transformed into a speedboat. Using its pusher propeller it can be turned into a go-kart by refitting the wheels but leaving the wing off, while also available as an option are skis. 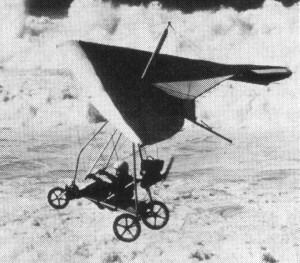 The price of the trike unit was US$3000 in 1982 and bought together with the Demon hang-glider wing it costs a total of US$4995. Flight Designs does not recommend the use of any other Rogallo with its trike unit and it is worth noting that its Demon Rogallo is not related to the British wing of the same name, made by Hiway. The later Jetwing ATVs had a belt reduction drive of 2.2/1 ratio, with a max static thrust of 220 lb (100 kg). Engine: Kawasaki TA440, 30 hp at 5500 rpm. Prop-eller diameter and pitch 36 x 16 inch, 0.91x0.40 m.
No reduction. Power per unit area 0.17hp/sq.ft, 1.8hp/sq.m. Length overall 12.0 ft, 3.65 m.
Total wing area 175 sq.ft, 16.27 sq.m. Nosewheel diameter overall 16 inch, 40 cm. Main wheels diameter overall 20 inch, 50 cm. Empty weight 216 lb, 98 kg. Max take-off weight 480 lb, 218 kg. Payload 264 lb, 120 kg. Max power loading 16.0 lb/hp, 7.3kg/hp. Load factors; +4.0, -2.0 ultimate. Max level speed 47 mph, 76 kph. Never exceed speed 52 mph, 84kph. Min sink rate 350 ft/min at 23 mph, 1.7 m/s at 37 kph. Best glide ratio with power off 7/1 at 25 mph, 40 kph. Take-off distance 50 ft, 15 m.
Landing distance 75ft, 23 m.
Service ceiling 10,000ft, 3050 m.
Range at average cruising speed 160 mile, 257 km.